From Janelle Monae to Dua Lipa, we had to stan. Just three words summed up last year’s Grammys ceremony: #GrammysSoMale. Despite plenty of worthy female nominees, men triumphed in most major categories. And to make matters worse, after the ceremony, Recording Academy president Neil Portnow placed the blame on women, saying they needed to “step up” their game in order to be recognized with a golden statue. One calendar year later and the story is much different. 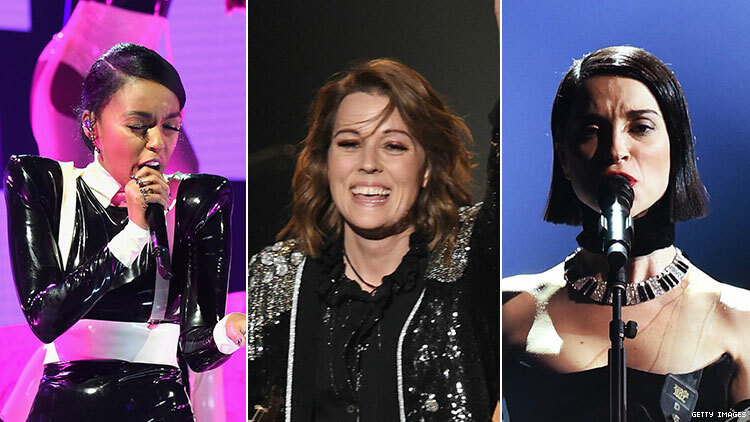 Not only did several women take home key Grammy categories, they also rocked the stage with stunning performances that underscored the importance and central role of women in the music industry. There were also several explicit references to queerness in the ceremony, something that, though it has happened before, feels rare during the broadcast. Lesbian folk singer Brandi Carlile walked into the 2019 Grammys as the most-nominated female artist and the third most nominated artist overall. Prior to the televised ceremony, she also won 3 Grammys for best American Roots song and best American Roots performance for “The Joke” and best Americana album for By the Way, I Forgive You. Carlile performed “The Joke” onstage at The Grammys and left jaws on the floor in the process. The telecast was no doubt many people’s first introduction to Carlile, though we’re sure to hear more from the self-proclaimed “lesbian chicken-farmer mom,” who also spoke to Out for its upcoming March issue. Queer rocker St. Vincent and gay fave Dua Lipa took the stage together to perform a mash-up of their songs “MASSEDUCTION” and “One Kiss,” in a set that, let’s just say it, oozed chemistry. St. Vincent was nominated for three Grammys, while Dua Lipa won for best new artist. Dua Lipa may not be queer herself, but she is definitely one of the pop princesses the gays have adopted as a fav. The Workout Dance Tempo singer earned the snaps and respect of many when, during her speech for winning best new artist, she shaded the president of the Recording Academy. “I guess where I want to begin is by saying how honored I am to be nominated alongside so many incredible female artists this year, because I guess this year we really ‘stepped up,’” Dua Lipa said in a nod to Portnow’s comments about female artists being invited to the winner’s circle. Janelle Monáe may have gone empty-handed in terms of Grammy wins, but she was a winner in our eyes for delivering one of the night’s most electric performances. Crooning and dancing to “Make Me Feel,” the lead single off of her Grammy-nominated album Dirty Computer, the pansexual singer also explicitly queered the song, which was already a bisexual anthem. Country singer Kacey Musgraves, a huge LGBTQ+ ally who has appeared as a guest judge on RuPaul’s Drag Race, performed her song “Rainbow,” a song of hope that has also become a queer anthem. During the performance, rainbow lights lit up the stage behind her, projecting a rainbow over her head. Musgraves later took home the biggest award of the night, album of the year, for her album Golden Hour. As if we didn’t love the often-political rapper enough, Cardi B became the first solo woman in the history of the rap album category to take home the top honor. She talked about her love for her baby, Kulture, during her acceptance speech, which she delivered through visible nerves. All of this, after the Bronx-born performer tore up the stage with a stand out (though likely lip synced) performance of her single “Money.” On this Grammys night, it was Cardi’s world and we were just living in it. Okurrr.